The new Measuring Spot Sensor simulates a tactile scan path or point distribution on a point cloud. 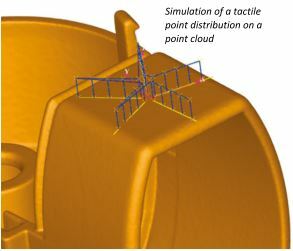 The measurement points or scan paths, as is the case of tactile sensors, are automatically distributed on the selected geometrical features using the WinWerth measurement software. The nominal element can be defined via patch selection or through the entry of the parameters. Depending on the geometrical feature, a multitude of distribution strategies are available based on helical, circular, and cylindrical surface lines; raster; stars, spirals, boundary curves and polylines. The scan path and point distribution can be tested and edited online during the interactive measuring using the coordinate measuring device or offline at a workstation in the office away from the machine; in the case of online use it can be applied directly. Existing measurement programs with automatically created scan path and point distribution can now be used for the analysis of point clouds and vice versa. With the help of this new function, for example, point clouds of gears can be evaluated with the Werth GearMeasure program.